Celebrating 100 Years Of Bernstein With Gianandrea Noseda : Deceptive Cadence Nina Totenberg speaks with the new musical director of The National Symphony Orchestra, as the ensemble gears up to mark the centennial of Leonard Bernstein. 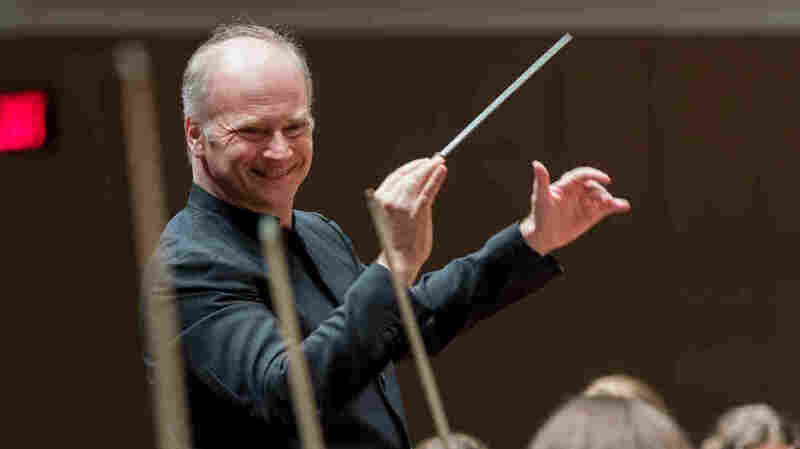 Gianandrea Noseda recently began his debut season conducting the National Symphony Orchestra. It is an important moment in the life of a symphony orchestra when a new conductor is selected — not just to lead the orchestra, but to create the programs, hire the artists and more. In short, to be the music director. In Washington, D.C., the choice was made with astonishing harmony. A search committee composed of board members and musicians from the National Symphony Orchestra agreed unanimously on their pick: 53-year-old Italian conductor Gianandrea Noseda, who comes to the job just as the John F. Kennedy Center for Performing Arts is beginning a yearlong celebration for the centennial birthday of one of Noseda's conducting heroes: Leonard Bernstein. The life of a successful conductor is nomadic, and Noseda's is no exception. In addition to his position in Washington, he is music director of the Teatro Regio di Torino Opera in Turin, Italy; artisti c director of the Stresa Festival, also in Italy; and, as if that's not enough, a regular guest conductor for major symphony orchestras in the U.S., Europe and Israel. He began his professional life not as a conductor, but a pianist. "I didn't have this vision that I would become a conductor," Noseda recalls. "But I started to look at these scores and I was fascinated." At age 27 he began conducting and, as it turned out, he was a natural. Noseda was quickly able to master the technique. "When you conduct, you don't produce the music yourself," he says. "You have to commit other people, to convince them to react to your gestures." Noseda has been called a radical conductor. He has a reputation for making audiences see old favorites with new eyes. Take, for example, his approach to Beethoven's Fifth Symphony. "You open the first page, and the first impression is, 'Oh, I know it,'" he says. "That is what I try to avoid. I try to think, 'I don't know this music.' ... If you start to ask questions, everything starts to sound new in your inner ear. The most difficult thing is to try to forget what is in your memory and re-approach. If this piece doesn't surprise me, how can I surprise the audience?" But, when it came to the NSO's 2017 Season Opening Gala, Noseda's debut as its new music director, Beethoven was nowhere to be found on the program. Instead, it was all Leonard Bernstein. Bernstein, the wildly prolific composer of the 20th century, was also among the most popular conductors of his era. Today, it is his music that is remembered --everything from West Side Story, On the Town and Candide to symphonies, ballets and Mass — a mammoth symphonic and choral work composed for the opening of the Kennedy Center in 1971. Jamie Bernstein, the composer's oldest daughter, tells me the hilarious backstory of how the piece was commissioned. It seems that Mrs. Jacqueline Kennedy first asked Bernstein to run the Kennedy Center. "And my father was not able to say no to Jacqueline Kennedy," Jamie says. "So he said, 'Oh I'm so honored, thank you very much.' And then he hung up the phone and went to my mother and said, 'Oh my God, what have I done? I can't run the Kennedy Center.'" It was left to Mrs. Bernstein to get him out of it, calling Mrs. Kennedy back with the suggestion that maybe it would be better for her husband to compose a piece for the opening instead. In its time, Bernstein's Mass was extremely controversial. The piece included not just an orchestra and three choruses bumping up against each other, but a rock band, a blues band and a brass band, reflecting the conflicts going on in the country at the time. And then there was the mass itself, an essentially theatrical work. "It's an opera. It's an oratorio," Noseda says. "It's a piece of the deepest spirituality." Some people in the church loved it. Others were shocked and had it shut down. The FBI and aides to President Nixon warned that Bernstein had put a secret message in Mass to insult the president. "It finally turned out that what they were worried about was the line in the standard Catholic liturgy, Dona nobis pacem — 'Give us peace,'" Jamie Bernstein says. Her father's ultimate vindication came in 2000, five years after his death, when Pope John Paul II requested a production of Mass at the Vatican. Mass was composed during the Vietnam War, a time of huge protests, generational revolt, the sexual revolution and the battles for civil rights and women's rights. But, as Noseda believes, the "upheavals of the '60s and '70s set the stage for what is going on now." "How connected the eras are," says the maestro, "it resonates so appropriately that it's almost eerie." Indeed, as Noseda observes, so does much of Bernstein's work. Noseda concluded his opening program debut last month with the symphonic dances from West Side Story. "West Side Story is a masterpiece, period," Noseda says. "[The] rhythmic patterns are incredible. But what I love most are the quiet moments of 'Somewhere.' I think they are the lyrical aspect, and the tenderness." From Mass to West Side Story, Noseda sees Berstein's work as capturing the beat of the modern heart.